The Ink Trap: Day Three of Krafty Peeks at Kraftin' Kimmie Stamps and a challenge: Anything Goes! 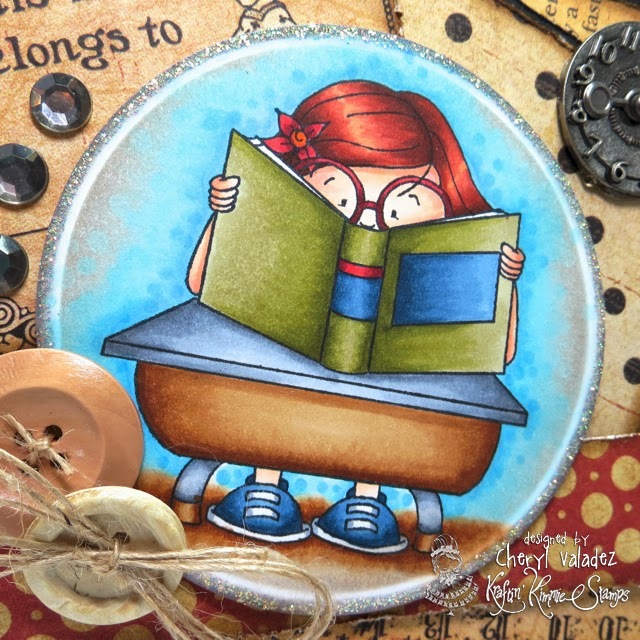 Day Three of Krafty Peeks at Kraftin' Kimmie Stamps and a challenge: Anything Goes! Welcome back to day THREE of our FEBRUARY Kraftin' Kimmie Peeks!!! The awesome new stamps just keep on comin'!! We are SO thrilled to share the newest set of THREE images with matching sentiments from CHERYL! This fabulous new NERDY set is called SMARTY PANTS!! This week our challenge hostess is JENNY! And her challenge is ANYTHING GOES!! So create a card, scrapbook page or altered item with a Kraftin' Kimmie stamp with no restrictions! Use any sketch, any design, any embellishments because Anything Goes! Have some krafty fun and join us this week because we'd LOVE to see your KKS designs. We hope you can play along for your chance to WIN some NEW Kraftin' Kimmie rubbah!!! Would you like to know who won the new stamp sets that we've previewed this week???!! Well, you'll just have to wait until TONIGHT at this month's ONLINE RELEASE PARTY!!! Hope you can join us for all the fun and excitement and prizes!!! We'll be releasing all the new stamps you've seen this week after the party at 7pm EST!! So come and hang out with us tonight for all the LIVE action krafty fun at the release party and then come on back here tomorrow to check out the release day blog hop! ALL the new stamps will be available on TONIGHT at the KKStamps Shop!! i love your shading/shadowing of all of your creations. I wish. Thank you for sharing always!! WOW...wow...wow...I do sooooo love your card Cheryl. I'm always thrilled to see what you create. This is just stunning with the vintage feel and then the pop of colour in that new gorgeous KKS image. Love it. Stunning! The color just pops right off there! I love the whole look of the card! I loooove this card Cheryl! Maybe you should think about giving it to me! What ya say! Huh! Huh! Gorgeous card! I love your coloring and papers. Beautiful card and such a precious stamp! I wish I could colour like that, gorgeous! She is lovely!! Awesome card design! WoW! Your card is magnificent Cheryl! I Love everything about it! oh so pretty, I love the vintage look and your coloring skills are WOW! love love love your card...the design and choice of elements is fantastic! Your card is always an event! Lovely, fabulous card for a book lover (I mean: me) LOL Thank you for your inspiration! love this card! the papers and embellishments are awesome!